There is no real grade system on the pencil, but I'd say it performs like a B with the point retention of an HB. Like most Indian pencils, it's got a dark line and a colorful body. The "HD" stands for High Density. I'm not sure exactly what that means, but I'm assuming it's about the amount of graphite in the core, though there is nothing on the website to confirm any difference between the Supreme and the Supreme HD. The core here is thicker than average, and reminds me of an Apsara Absolute, in thickness and point retention on such a dark pencil. The wood is likely basswood / linden, treated, like the nicer Hindustan pencils. As far as I can tell, all the cores are fairly centered. 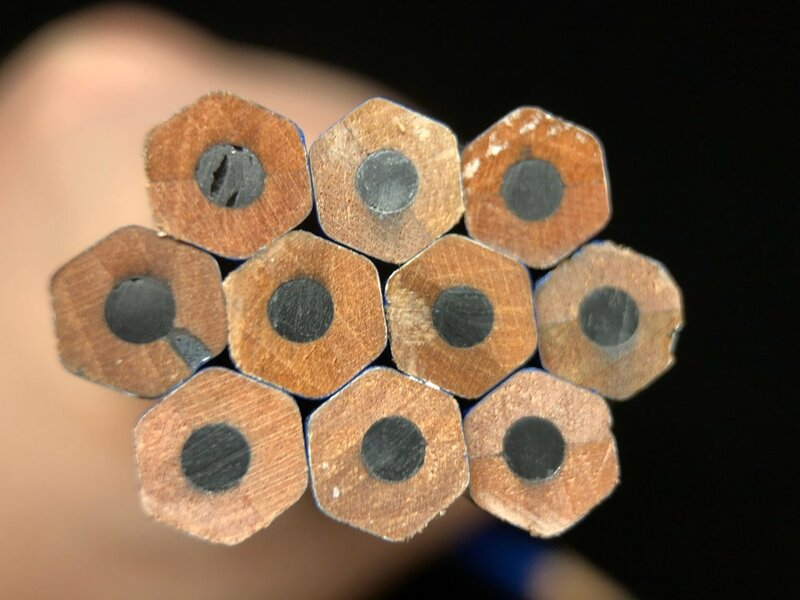 The pencil I used for this review sharpened nicely with multiple styles of sharpeners and point lengths without issue. Cosmetically, the pencil also reminds me of the Apsara Absolute. Many of the Hindustan pencils are of varying degrees of quality in terms of paint and imprint, but the Absolute is one that is always really well painted. 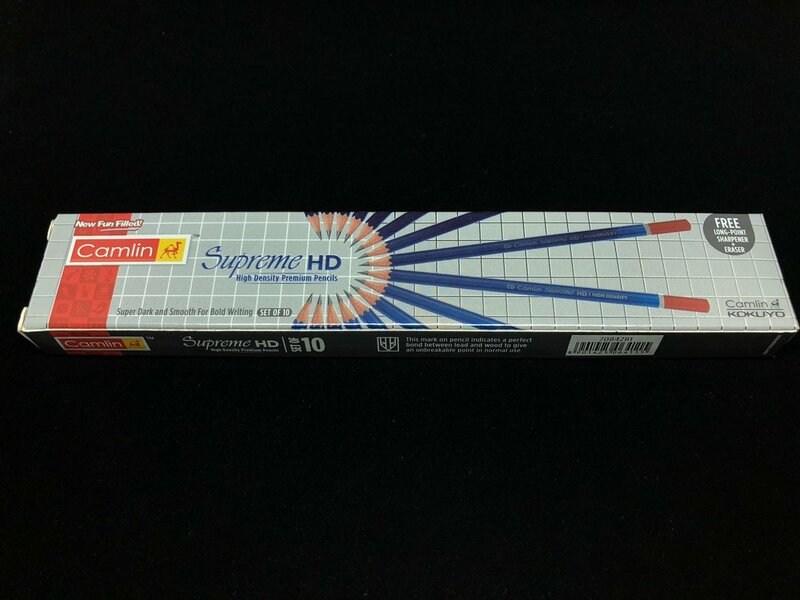 The Camlin Supreme HD is the same in this aspect. While the lacquer does not have quite the consistency of a Japanese pencil, it is among the nicest painted Indian pencils I've used. On this one, the lacquer is blue with a red end dip. A white stripe separates the body from the end. 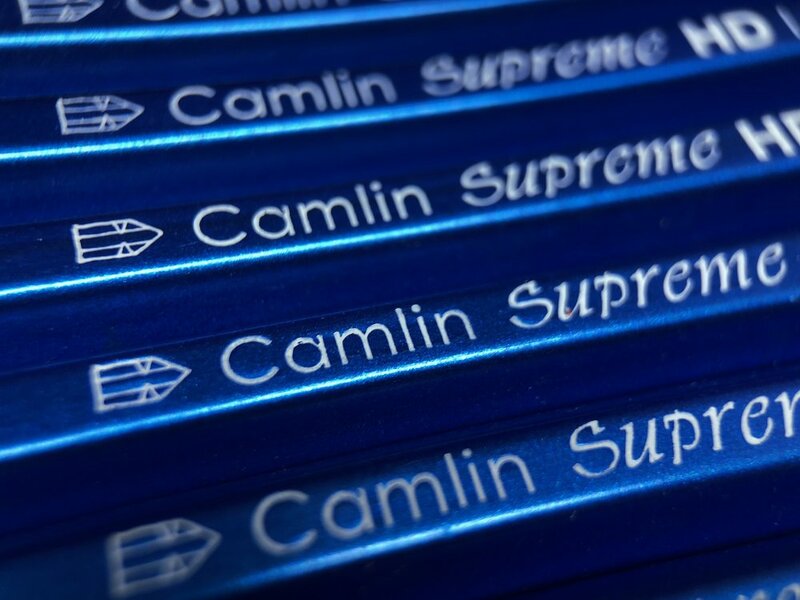 The regular Camlin Supreme is all black with a white and gold stripe and looks kind of like a Tombow Mono pencil, but I didn't use one of those for this review. I couldn't review a box of Indian pencils without talking about the extras. A free long point sharpener and eraser is included in the box. I purchased these through The Curios. The most recent price list I've seen lists them at around $2 USD, and depending on the rest of your order, the shipping. His shipping is calculated via the weight of the total order and where you are in the world. For me, it ended up being around $4 USD, but I had ordered multiple boxes of pencils. Your shipping may vary, but as far as I know, he ships worldwide. There's no website, he just does all the business through Facebook. Overall, this is a solid pencil, and definitely one of the better Indian offerings. 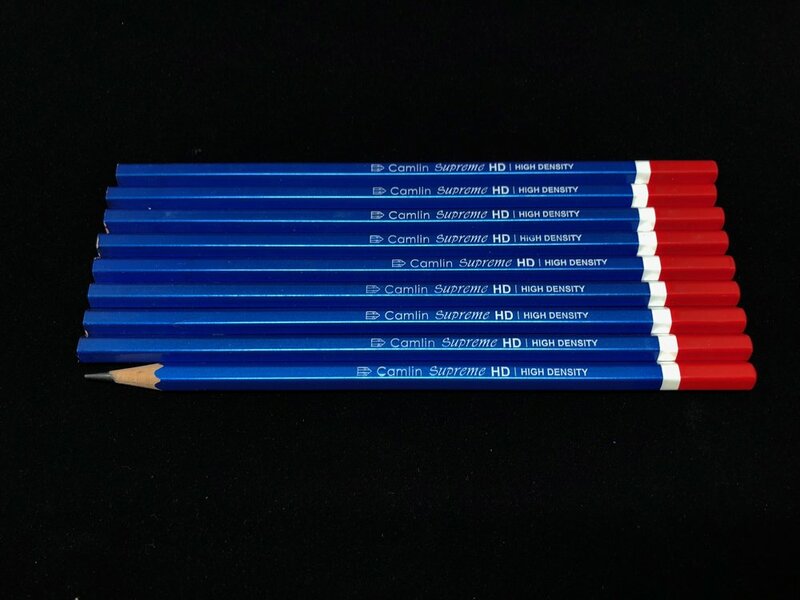 If you're a fan of the Apsara Absolute but are looking for something a bit more colorful than the grey/blue combo of that pencil, the Camlin Supreme HD is definitely a viable alternative.